BANQUETS & PARTIES – Rawhide…Your Way! Rawhide Western Town & Event Center is the valley's premier destination offering groups a unique journey back in time. Encompassing over 160 acres of beautiful Sonoran Desert, Rawhide is nestled in the center of Wild Horse Pass in the Chandler area. Guests can enjoy Rawhide's authentic western ambiance, on-site amenities, and stunt shows by The Arizona Roughriders. Or, select the Rawhide Event Center, Sonoran Lawn, or The Park, for venues with no set theme that you can customize for any style event. Rawhide Western Town & Event Center is the perfect place to host a private event or put on a public event or festival – whether it's for a group of 10 or 10,000, we have the perfect venue for you! The first showcase location when you enter into Rawhide is our Wagon Wheel Plaza. This ideal outdoor area is 13,000 sq. ft. and includes a large built-in stage and bar. This plaza can be encircled to close it off from the public or opened up to be the pinnacle of Main Street! This space can be customized in size to fit up to 500 people. One of our most popular locations is our Mission Patio which has breathtaking views of the mountains. This outdoor area includes a built-in stage/platform area as well as a built-in bar and concrete pad for line dancing or whatever activities your group may enjoy. This space can accommodate up to 300 people and has two adjoining indoor locations as well. Rawhide’s Moonshine Room is ideal for groups of 50-175 guests. The Moonshine Room, located just off Main Street, provides western ambiance for meetings and presentations. A connecting patio is available for outdoor receptions. This unique room holds a large western bar with intricate detailing and artwork. The adjacent Mission Patio is a perfect connection for outdoor receptions as well. The Cantina can ONLY be booked with the Mission Patio as they share an entrance. This is a perfect space for meetings and dinners up to 80 people and includes a built-in bar from the Wild West era that adds great ambiance to any occasion. The Adobe Room, which is part of the Rawhide Steakhouse restaurant, is a private western dining room that can accommodate up to 350 guests for an occasion not to be forgotten. The room includes a built-in stage for live performances and presentations as well as a large BBQ grill for your steaks to come off hot & delicious! The Sunset Room, which is part of the Rawhide Steakhouse restaurant, is a private western dining room that can accommodate up to 250 guests for an occasion not to be forgotten. The room includes a built-in stage for live performances and presentations as well as a large BBQ grill for your steaks to come off hot & delicious! Rawhide, Arizona’s original family Steakhouse features our Golden Belle Saloon. Quench your thirst and step up to the authentic 1880’s 25 foot bar inside the Saloon, learning all about the bar’s journey to get to Rawhide. Connected to Rawhide’s Steakhouse is our Sunset Patio, an ideal outdoor location for any cocktail reception, silent auction set up or small party. This space can be customized to fit up to 150 people. This space can handle most any event, with room for up to 100 people! Its open layout is perfect for both corporate and personal events. Located near the front entrance to Rawhide, it provides easy access to our Town’s shops and attractions! Right in the heart of Rawhide’s Main Street is our Chuck Wagon Plaza. This space is ideal for outdoor cookouts, hosting large buffets, line dancing and so much more! The space can be customized for up to 150 people and is around 8,000 sq. ft. total. The area is surrounded by 1880’s western building facades and BBQ grills. Our newest venue is the gorgeous 15,000 sq. ft. lawn overlooking the Riverwalk. Stunning water views and lush green grass make this the perfect venue for your outdoor occasion. A unique cowboy cookout awaits you and your next group at Rawhide of Wild Horse Pass. Enjoy authentic western fare, music and dancing under the stars. Surrounded by breathtaking desert landscape and an amazing view of the sacred Estrella Mountains where the wild horses roam free. Akimel Basho is an outdoor space replicating a traditional Gila River Indian Village with pole and grass huts and shade spaces, log seating areas and plenty of open area to create a rustic Native American feeling for your event. Personal and company events will be enhanced by this unique venue. This remote location is perfect for fully private groups and long-term events. Maricopa Wells is set up as both an 1880’s replica town with dirt streets and façade buildings and also has a full lawn area with staging, grills, rock & water features. Rawhide’s 48,000 sq. ft. pavilion offers event space that can house your largest function, trade show, concert, banquet or party. This fully enclosed area has oversized garage doors for easy flow to our Sonoran Lawn as well as easy load in and load out access for events. 175,000 sq. ft. of beautiful Sonoran lawn perfect for company picnics, festivals, team building and corporate outings. Connected to our Rawhide Event Center, this location is ideal for groups of all sizes. Get up close to the action with a private rodeo held in the Rawhide Rodeo Arena. 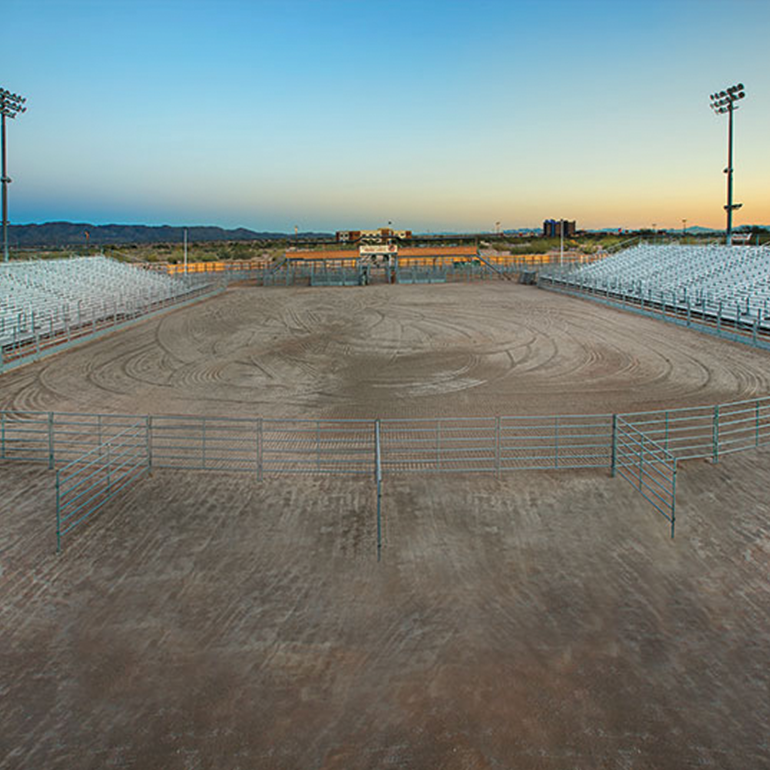 With seating for up to 6,500 people, groups can add authentic western excitement to any occasion. Want exclusive use of our entire Town for your large event? We can handle groups from hundreds to thousands! This option gives you an “a’ la carte” availability to specific shops, entertainment and attractions you select to be available to your group during their visit to Rawhide!